STANLY COUNTY – A 20-year-old West Stanly firefighter went into cardiac arrest on Sept. 12, according to a press release from West Stanly Fire Department (WSFD). SALSIBURY – The Rowan Museum will open its exhibit honoring the history of firefighting in Rowan County at 1 p.m. Sunday. MONROE – An emergency responder was killed Tuesday after an ambulance was involved in a crash with an tractor trailer in front of a hospital. WINNABOW – Robert Kye started at the Winnabow Volunteer Fire Department when he was 15 years old, and 50 years later his passion for firefighting still burns bright. Members of Maury Fire Rescue, taken at the 20th annual Greene County Fireman’s Association Softball Tournament held on September 22nd. OAK ISLAND – Brunswick County firefighters were dispatched to 1019 West Branch Drive in Oak Island on Tuesday and arrived to find a well vacation home. WINSTON-SALEM – Growth in the Hanes Mall area of Winston-Salem led to the construction of Fire Station No. 2, a $1.3 million station twice as large as the one it replaced in 2004 on Griffith Road. 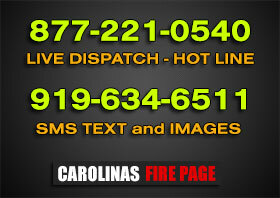 ROCKY MOUNT – On Saturday, September 15, 2012 at 17:51 hours, Rocky Mount firefighters were dispatched to a reported structure fire at 5301 Marriott Street for a reported dwelling fire.